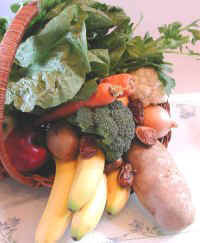 Our pasta recipes are prepared in what many people would consider a non-traditional quick method. 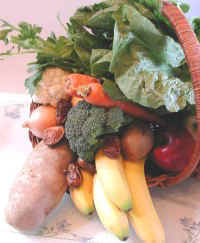 We prepare the veggies and sauce in either a large covered ceramic dish in our microwave oven or in a wok. If cooking in a wok, stir fry the veggies in a little water at 375 degrees F. and reduce the heat to simmer when the sauce is added. Wash and peel the onion and garlic. Dice the onion and crush the garlic and place in the baking dish or wok. Add the oregano, fennel seeds, and hot pepper sauce and mix well. Cook until the onions start to become semi translucent. Wash and slice the mushrooms. Wash and cut the broccoli into bite size pieces. Add to the cooked onions. Add the crushed tomatoes, mix well and simmer for about 20 minutes. While the veggies and sauce are cooking, cook the pasta. We cook our pasta on the stove top either in a regular pot or in a pasta pot. When cooking pasta in a conventional pot on the stove top, we often found that the pasta would stick to the bottom of the pot. 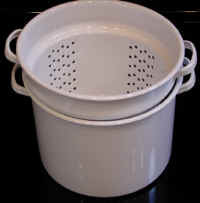 Then we would pour the boiling water and cooked pasta into a colander to drain off the water. With the pasta pot, the pasta never sticks to the bottom of the pot, and when it's cooked, all that is necessary is to lift out the inner pot and the water drains out. Do not cook the pasta with the lid on the pot or the water will boil out between the inner and outer pot. When cooking spaghetti in the pasta pot, be sure to stir the pasta when it begins to soften, in order to make sure that none is sticking through the holes of the inner pot. 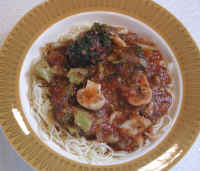 The pasta-veggie sauce can either be served over the angel hair or the angel hair can be mixed into the sauce.